Before I started eating clean, I always just bought canned beans. However, once I finally took the plunge over to dried beans, I never went back. Dried beans are very budget friendly. Since I get asked so many questions on how to prepare dried beans, I thought I would write this handy tutorial. I was once very intimated by the whole process myself. Dried beans are so much cheaper and they taste cleaner as well. With canned beans, you get added sodium, BPA and other additives. Sure there are BPA free canned beans, but they can be pretty pricey. Dried beans are free of all of those things and they are very inexpensive. Especially when you buy them in bulk like I do. In their dried form, they last for quite some time. I store mine in glass jars in my pantry. One thing to remember, dried beans are not salted at all, so you will most likely have to add salt to the dish you are making. When you buy dried beans, they look like this. They are very hard. So they need to be soaked overnight. I use this old cookie jar to soak mine. It’s just the right size. 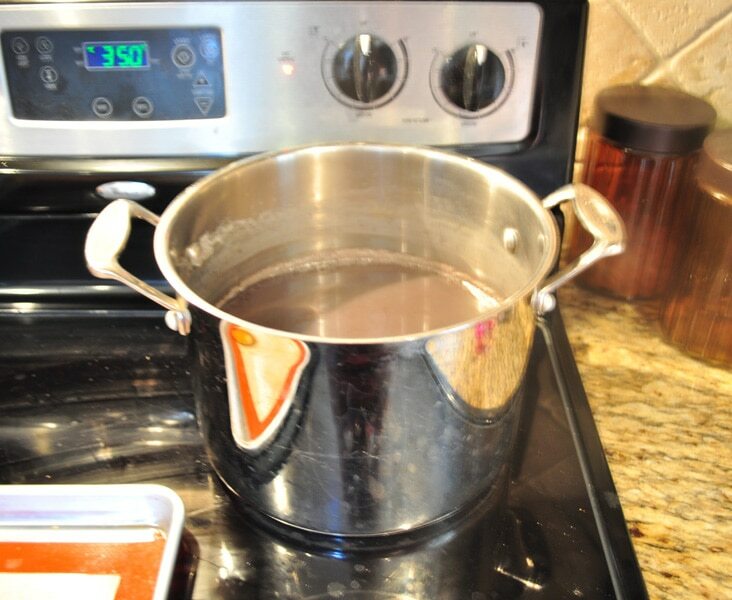 Beans double in size after soaking, so it’s a good idea to fill the container pretty high with water. So if you add 2 cups dried beans, you will have close to 4 cups after soaking. Once the the dried beans have soaked overnight, drain and rinse them well. I apologize for the awful photos. My kitchen has zero natural light. But you can pretty much get the idea. Once they are drained and rinsed. 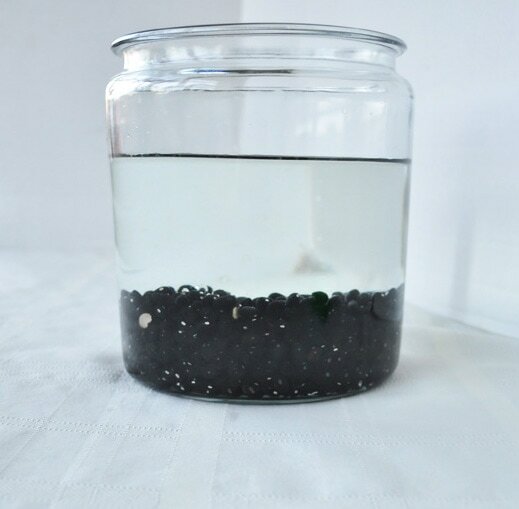 Fill a large pot with brand new water and add the beans in. Set the stove on high and bring to a boil. Once the water starts boiling, a foam will start to appear on top of the water. Use a slotted spoon to remove the foam. This actually reduces the amount of gas in the beans. Some beans take longer than others to soften. Chickpeas take the longest. 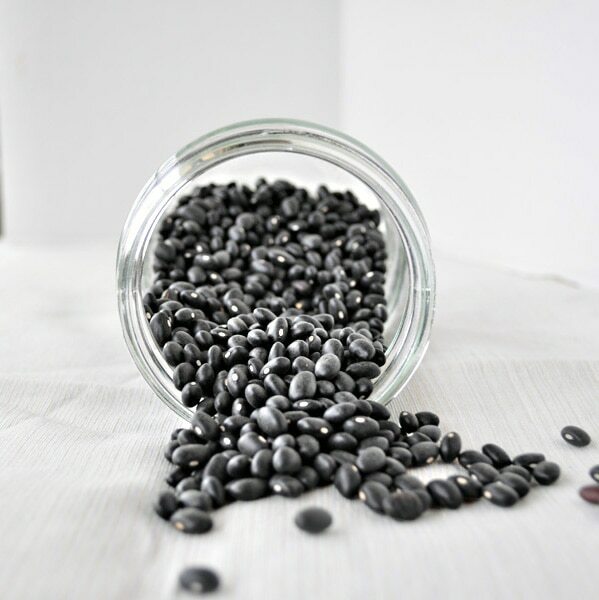 If you get a pressure cooker , you can prepare dried beans in a much shorter amount of time. I am still trying to convince my husband why we need yet another appliance. LOL. This picture was actually taken after my beans had been boiling for about 15-20 minutes. Once you have the beans soft, you can drain and rinse again. Now the beans are ready to use. They will only last 4-5 days in the fridge. However, you can freeze them for longer. This is what they look like after they are done. As you can see, the process is pretty simple. I hope you find this post helpful. I've been intimidated by dry beans too, but this sounds easy so I am going to give it a try. How do you freeze yours? I'm thinking freezer bags. Would that work? or something else you suggest? Thanks for your wonderful blog! love it! I looooooove all your ideas and info. It has made me a better, healthier mom. As w most of these things, it's just having the knowledge of how to do it. I've been wanting to do the dried beans for a while but had one bad experience where I couldn't get some black beans to soften. I'm tryin again!!! Thank you - you are awesome!!! Love all your posts. Thanks for the tip! I didn't know about the seaweed. Does it leave a taste? I get mine at Natural Grocers in Richardson. Love that place! I bought a bean pot at a yard sale, how long does it take to bake beans in it? Is a bean pot like a crock pot? 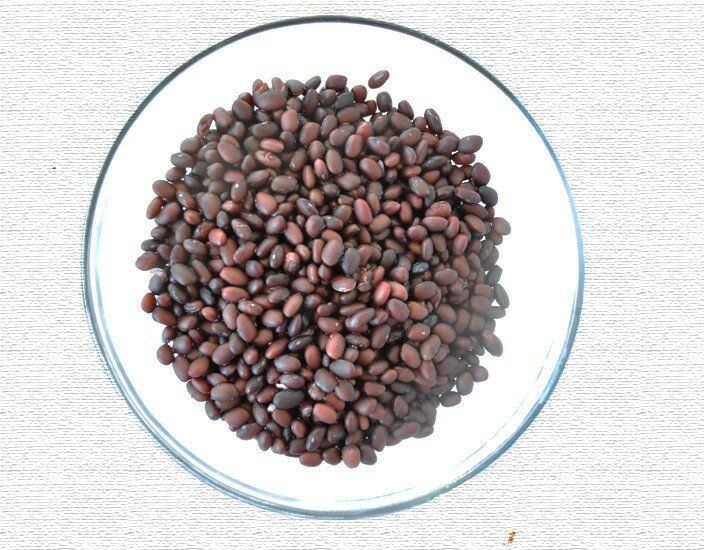 I have been trying to use dry beans, but after using different methods, including this one, I continue to have problems with the skins separating from the beans. It never fails, my beans blow apart as soon as they boil, or shortly thereafter, leaving me with less full bean in the end. Does anyone else have this problem , and what might I be doing wrong? Do you think you are boiling them too long? it seems to happen even when I cut the boil short. I have tried salting the water and vinegar (tips from Cuban friends)I thought maybe it was the age of the beans, but now I live in an area where there is a high bean consumption, I can't imagine beans hanging on the shelves too long. I am goin to they again today..
Maybe you're boiling them too hard? Maybe a gentle simmer, or something in between that and a hard boil, would be better? I've had a similar problem in the past, but found that simply turning down the heat solved the problem. Good luck! Experimentation is a wonderful thing! :) Please let us know if and how you solve your problem. We use pressure cooker for cooking dried beans and saves a lot of time. We also make brown rice in the pressure cooker and it comes perfect every time, almost like rizzoto. A pressure cooker is on my wish list! 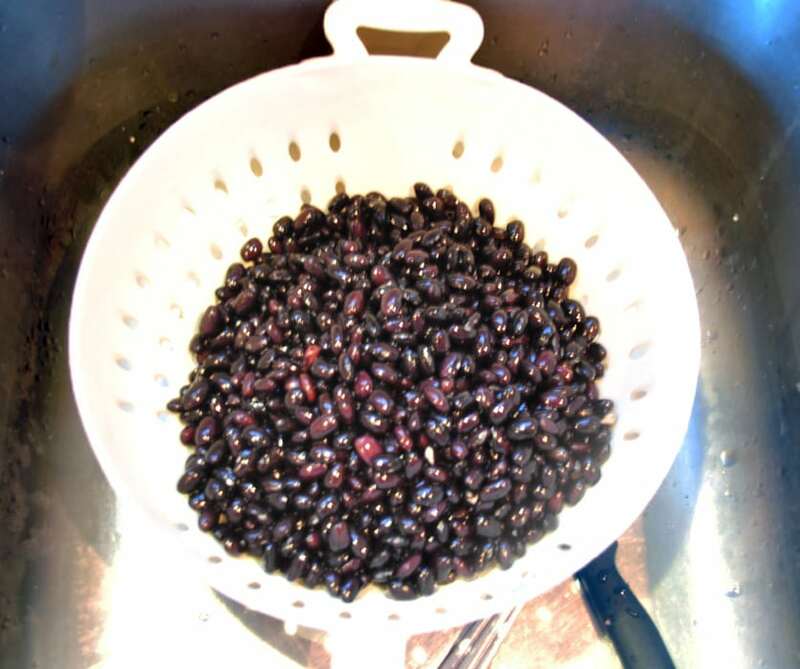 I don't soak overnight, probably because I never remember to do it, instead I wash the beans and then put in the pot I'm going to cook in and cover with plenty of water, bring to a boil, boil for 5 minutes and then turn off the heat, slap a lid on and let sit for an hour. Then I rinse really well. Then cook as usual. I know this sounds weird, but I put a peeled russet potato in with the beans (whole, do not chop) and that works to take all the gas out. Ask my husband...the firefighter. He HATES that I de-gas the beans. It's a "man-thing", I guess. DO NOT EAT THE TATER!!! Again, ask my husband. If you buy a bag of dried beans at the grocery store, there will be instructions printed on the bag about how to prepare/cook them. To me, they are FAR superior to canned beans, especially in texture...they are way more creamy......YUM! Plus, they have no sodium added, so you don't have to worry about salt content. But, always remember that a can of beans, whatever color, can be a great shortcut sometimes. Be sure to drain and rinse them really well to cut down a bit on the additives. PS - For me, it's not the money, because canned beans are cheap; it's the quality and healthfulness. I agree that dried beans taste much cleaner! growing up in South Texas we never used canned beans. Of course our beans of choice is pinto. If you have to add water to cooking beams make sure it is HOT. If you add cold is tends to make them hard. Also do not add salt to your beans until they are soft. My husband likes to add some bacon, chili powder, onions, garlic and a little liquid smoke to them.